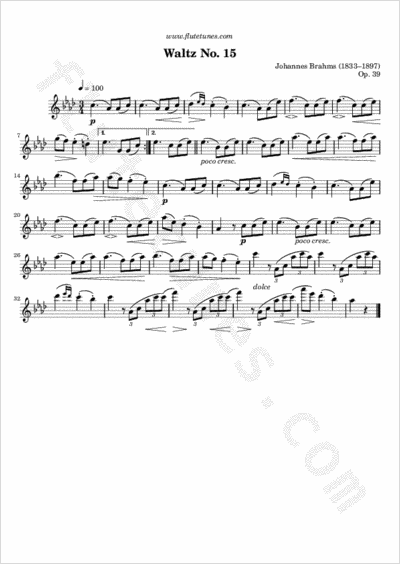 This waltz comes from a set of 16 short waltzes for piano duet written by Johannes Brahms. Published in 1865, and dedicated to the Bohemian musicologist Eduard Hanslick, the pieces had an instant success, contrary to the composer's expectations. Over time, number 15 in A-flat major has acquired a life of its own. You can choose to play this flute arrangement as a slow, sweet lullaby. Take advantage of dynamics to express all its feelings.